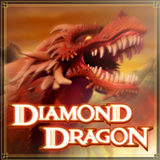 Feuding Medieval families battle a ferocious Dragon and the glittering treasure it guards in the new Diamond Dragon slot from Rival Gaming. Slots Capital and Desert Nights casinos have just introduced the new real money online slot and, until the end of this month, both will give you a $10 Freebie and up to $1500 deposit bonuses to take it for a spin. No deposit required; up to $180 cash-out. Bonuses are valid December 22-31, 2016 only. Slots Capital and Desert Nights have just introduced the new Diamond Dragon slot with 3X Super Round. Diamond Dragon is a 50-line, 5-reel slot where the Northern Prince, Golden King, Shifty Baron, and Desert Queen all want the Dragon’s treasure of Golden Chalices, Magic Vials, and Diamonds. Golden Axe symbols award up to 50 free spins. Silver Axes trigger Super Round spins where there are extra Expanding Wilds and up to 3X multipliers. Diamond symbols start a bonus pick game with instant prizes. The Dragon icon is an Expanding Wild that can multiply wins up to 3X. During free spins, it doubles wins. During Super Round spins there’s a 3X multiplier to triple payouts. Try this new game in the download, instant play and mobile casinos for smartphones and tablets at Slots Capital Casino or Desert Nights Casino. You'll find a wide selection of casino games from Rival Gaming there. Over the holidays you might like the Christmassy Snow Wonder slot. Or the new Wishing Cup slot that debuted last month. It takes players back to the splendours of Ancient Egypt to win jackpots up to $5000. You still have a few days to get Advent calendar Christmas presents -- bonuses up to $1000 and lots of freebies.